PhilaPOSH is the only organization in the Greater Philadelphia Area that makes worker safety and health the top priority. We are not a government agency and our strength depends on our members. In 1975 concerned union members, workers, legal and health professionals founded PhilaPOSH. We are an independent organization which works closely with the Pennsylvania State AFL-CIO, the Industrial Union Council of New Jersey, The Work Environment Council, County Councils and other occupational safety and health groups across the nation and Canada to educate union members, safety representatives and the general public on a wide variety of job health and safety topics, including Workmen’s Compensation, recognition and control of hazards, OSHA and other laws, legal issues, and much more. We are unions, health and legal professionals working together since 1975 for a safe and protected workplace as well as for the rights of injured workers. Organized in 1975, the Philadelphia Area Project on Occupational Safety and Health (PhilaPOSH) was the second organization formed in the United States by unions, health and legal professionals that focused on health and safety issues faced by workers and their unions. Over the past 30 years we have provided assistance to hundreds of unions and thousands of workers, both union and non-union. 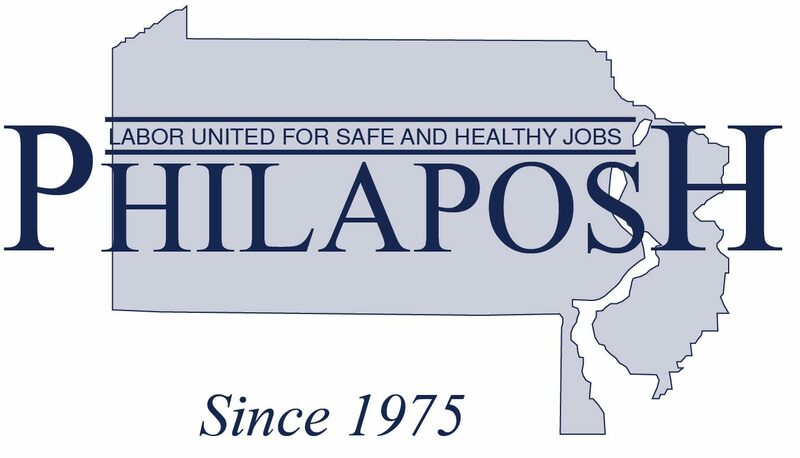 Our Board of Directors is comprised of 20 organized labor representatives who oversee the operation of PhilaPOSH. PhilaPOSH has won grants from the Occupational Safety and Health Administration (OSHA), Environmental Protection Agency (EPA), and the Philadelphia Foundation, City of Philadelphia, just to name a few. But the vast majority of our funding over the past 30 years has come from grass roots support and individual donations. Unions and individuals make up the bulk of our support. PhilaPOSH works closely with International Unions, federal agencies (like OSHA) and a national network of 25 Coalitions on Occupational Safety and Health (COSH Groups). Our award winning staff and volunteers quickly respond to your requests for assistance. We are an educational, consulting and political action organization that works for you, our supporters. Unions become part of PhilaPOSH by contributing “sponsor” dues annually at the rate of $.90 per member per year, minimum $100, maximum $700 per year. Dues are set by the membership. Sponsor unions receive 10 copies of Safer Times each quarter. They appoint a member to the Board as well as delegates who vote at meetings. In addition, they have instant access to health and safety information and other forms of support. PhilaPOSH has a national reputation for innovative approaches to organizing political pressure on city, state and federal legislators to pass new laws and regulations that would give workers more rights to safe jobs. We have worked just as feverishly to defeat negative laws and regulations that would deny safe job rights to workers. Up to six million workers are injured each year in the United States – 6,000 killed outright and 600,000 suffer from repetitive strain injuries (RSI). At least 50,000 die each year from work related disease. PhilaPOSH has two Injured Worker groups in Philadelphia and Bucks and Counties. These groups meet monthly to learn what effects workers compensation laws have on them and their families. They share experiences and resources for mutual comfort, support, and political action. Since 1988, PhilaPOSH has led the organizing of the Workers Memorial Day Observance at Penn’s Landing in Philadelphia. Co-sponsored by the AFL-CIO, this event has become the highlight of each year’s labor activities in our region. Hundreds of union leaders, injured workers, attorneys, health professionals, religious and political leaders attend this extremely moving ceremony each year. PhilaPOSH is not listed in the United Way Book this year so you won’t find our Number in there to help you make a contribution. However, we are listed on the United Way Web Page and our number is 418 under donor choice. We hope this does not cause you any inconvenience and we thank you for your continued support!